Gongriep founded De Hemmes in his hometown of Zandaam in 1990. The yard changed its name to Holland Jachtbouw and has since gone on to launch a number of notable yachts including the 46 metre aluminium schooner Windrose of Amsterdam and the 62 metre flagship Athos. His passion for sailing saw Gongriep rack up several records including twice breaking the Transatlantic sailing record for classic schooner yachts on board Windrose of Amsterdam in 2002 and 2005. 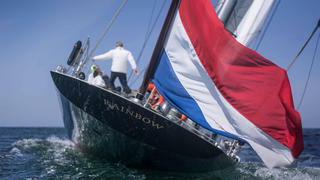 J-class yachts were also a big part of Gongriep’s life and in 2012 his most recent yacht Rainbow was launched as an exact aluminium replica of the classic sailing yacht that won the 1934 America’s Cup. She is the first J-class yacht to feature a silent hybrid propulsion system. Louise Morton, Secretary to the J-Class Association, added: "We and the J-Class family are shocked and saddened by this tragic news. Our thoughts are with his family and friends at this sad time."